Multiple baits in the Rapala® Respected Brands family helped account for three of the top 5 finishes in last weekend’s Bassmaster Elite Series tournament on New York’s Lake Champlain. In placing second, third and fourth, respectively, Seth Feider, Brandon Palaniuk and Jacob Wheeler caught a combination of big smallmouth and hefty largemouth bass on Rapala® and Storm® baits, and with VMC® hooks and weights. Minnesota pro Seth Feider notched his second runner-up finish in his young Bassmaster Elite Series career, catching three five-bass limits in the three-day Champlain tournament for a total weight of 57 pounds, 14 ounces. When he targeted smallmouth, he caught them drop-shotting a No. 2 VMV Neko Hook dressed with a small tube bait. A ½ oz. VMC Tungsten Drop Shot Cylinder Weight kept his bait where he wanted it. After VMC unveiled the Neko Hook last year, Feider began using it for both Neko rigging and wacky rigging. “Then I had such a good landing percentage on it, I decided to use it as my drop shot hook for smallies.” The decision paid off – he drop-shotted with a Neko Hook to win Bassmaster’s 2016 Angler of the Year Championship tournament. Neko Hooks feature a black-nickel finish, wide gap, 3-degree offset point, resin-closed eye and a forged, long shank. They’re available in four sizes: 2, 1, 1/0 and 2/0. Feider’s main drop-shot line of 6-pound Neon Lime Sufix 832 Advanced Superline® helps him ensure his bait is directly below his depthfinder. A 15-foot leader of 8-pound Sufix® Castable Invisiline™100% Fluorocarbon gets his bait down fast. Brandon Palaniuk placed third on Champlain, weighing three five-bass limits weighing a combined 57 lbs. 5 oz. 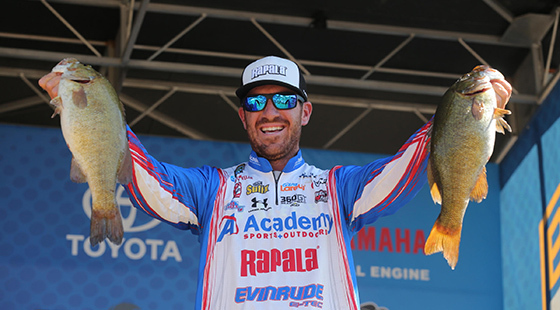 The top-five finish helped the Idaho pro retain his lead in the Toyota Bassmaster Angler of the Year race with only one event remaining in the season. About half the bass Palaniuk weighed came on an Arashi® Spinbait in the Green Gill color scheme. Still more came on a No. 13 Arashi® Top Walker and a Shadow Rap Deep in the Haymaker color pattern. Although similar in appearance to a top-water prop bait, a Spinbait is a finesse offering you fish deep for suspending bass. And although suspending bass are notoriously hard to catch, Spinbaits command their attention like other lures can’t. After Palaniuk determines a depth at which fish are suspending, he makes long casts to the area and counts down his Spinbait to the strike zone. He then reels it very slowly through the school. Arashi Spinbaits measure 3 1/8 inches, weigh 1/3 oz. and comes in 10 fish-attracting color patterns: Hot Blue Shad, Bluegill, Blue Back Herring, Wakasagi, Ghost Hitch, Ghost Pearl Shad, Green Gill, Pro Blue, Black Silver Shad, Green Gold Shad. A long-glide, walk-the-dog action, a powerful wake and a multiple-rattle sound combine to help Arashi Top Walkers call in the biggest bass from the farthest distances. Top Walkers come in two sizes, both of them big – 4 ¼ inches and 5 1/8 inches. They feature four bearings that broadcast a variable pitch frequency, mimicking the sound of schooling baitfish that predators can’t ignore. The 4 1/4-inch Top Walker weighs 3/4 of an ounce. The 5 1/8-inch model weighs 1 1/8th ounces. Both models come in ten color patterns, most of them slightly translucent: Green Gold Shad, Hot Blue Shad, Pearl Ayu, Bluegill, Blue Back Herring, Wakasagi, Ghost Hitch, Pro Blue, Ghost Pearl Shad and Black Silver Shad. Indiana pro Jacob Wheeler placed 4th with a three-day total weight of 56 lbs. 10 oz. The bass he weighed came on a Shadow Rap® Deep jerk bait, a Storm 360GT Searchbait and a Carolina Rig armed with a VMC Wide Gap Hook. Shadow Raps combine a horizontal struggle with a vertical fade, perfectly mimicking a dying minnow’s movements. They are designed to target bass and other gamefish in two to four feet of water. Shadow Rap Deeps target bass in four to eight feet. On Champlain, Wheeler fished a Shadow Rap Deep in the Moss Back Shiner color pattern. He threw it on 12-pound-test Sufix Castable Invisiline™ 100% Fluorocarbon. Both the shallow-running and deep-running Shadow Raps come armed with three No. 6 VMC black-nickel, round-bend hooks and are available in 24 color patterns. Each measures 4 3/8 inches and weighs 7/16 of an ounce. Creating the ultimate illusion of natural movement, 360GT Searchbaits pair a lifelike, single-ball rattling jig head with a realistic, soft body with 3D holographic eyes and a toe-in boot tail that imparts incredible action at any retrieve speed. “GT” stands for “Go To” bait. 360 GT Searchbaits are available in 11 color patterns: Chartreuse Ice, Gaga, Herring, Houdini, Hot Olive, Marilyn, Pearl Ice, Smokin’ Ghost, Smelt, Tru Blue and Volunteer. They are available in three sizes: 3 ½ inches (1/8 ounce); 4 ½ inches (1/4 ounce); 5 ½ inches (3/8 ounce). Each size comes in a handy package containing one pre-rigged bait and two extra bodies. On Champlain, Wheeler fished a 3 ½-inch 360GT in the Herring color pattern. He rigged it on a 3/8 oz. VMC Moon Eye Jig on 12-pound-test Sufix Castable Invisiline 100% Fluorocarbon. Wheeler’s Carolina Rig comprised a 3/0 VMC Wide Gap Hook, a main line of 17-pound-test of Sufix Castable Invisiline 100% Fluorocarbon, a 14-pound-test leader of the same line, and a VMC barrel swivel. Watch Wheler’s Magical Final Day at Lake Champlain where he lands his limit in a span of a few minutes. Tennessee pro Ott DeFoe also finished in the top 10 on Champlain, weighing 55 lbs. 7oz. to place 7th. He caught his fish on an Arashi Spin Bait in the Wagasaki color pattern, a Shadow Rap Deep in the Elite Blue pattern, a 3/4 oz. Terminator Pro Jig in the Blue Olive pattern and a Terminator Poppin’ Frog in the Black Camo pattern. This entry was posted in Rapala and tagged Arashi, Arashi Top Walker, Arashi® Spinbait, Brandon Palaniuk, Castable Invisiline 100% Fluorocarbon, Jacob Wheeler, Moon Eye Jig, Neko Hook, Ott DeFoe, Poppin’ Frog, Pro Jig, Rapala, Seth Feider, Shadow Rap Deep, Storm, Sufix, Terminator, VMC, Wide Gap Hook. Bookmark the permalink. RE: Rapala’s / Luhr Jensen’s Crippled Herring metal jig…I do not see any of the pros jigging with Crippled Herrings for smallmouth bass. The 1/6 oz gold Crippled Herring once held the Ohio record smallmouth of 8lb 1 oz caught in lake Erie near Lorain. I personally have jigged off Erie , PA with a 3/4 oz chrome Crippled Herring in 45 feet of water and caught numerous 4-5 lb smallmouth by finese bottom-bouncing the jig between the boulders. Record-catching lures only stop catching record fish if they are not used. Oops, almost forgot, the 5th largest IGFA record largemouth ever caught was on a 3/4 oz chrome Crippled Herring…17 plus lbs. Check it out.